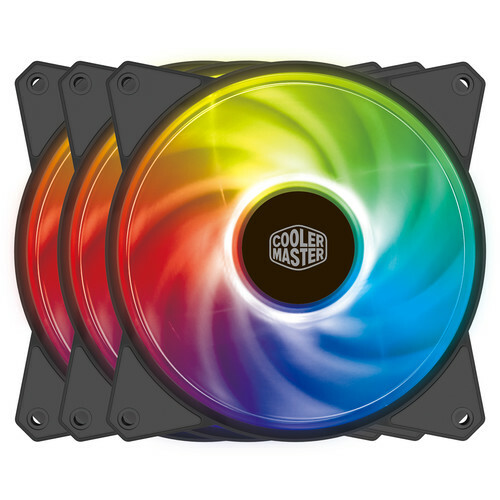 Keep your PC build cool and quiet with the MasterFan MF120R ARGB 3-in-1 120mm Fans from Cooler Master. This package comes with three 120mm cooling fans. Features include addressable RGB lighting that's compatible with most RGB-capable motherboards, noise-reduction technology, sound-absorbing rubber pads, a hybrid blade design, and smart sensors that help to prevent cable snags. The included Addressable RGB LED Small Controller lets you change RBG color modes without software, and it boasts a sensor-aided thermal detection mode that changes fan colors depending on your PC's internal temperature. Customize your fan colors as you see fit. Compatible with ASUS Aura, ASRock RGB, Gigabyte RGB Fusion, and MSI RGB. Boasts a mix of noise-reduction technology and sound-absorbing rubber pads designed for quiet operation even when your PC is working overtime. A combination of jet engine and helicopter blade designs helps to deliver the static air pressure you need without sacrificing airflow. Designed to protect your cables and components from getting snagged, damaged, or pulled by your fans. To enable addressable RGB lighting, you'll need a motherboard with an addressable RGB header, or the ARGB LED Small Controller, which is included. The ARGB LED Small Controller features six different modes and speed adjustments. Box Dimensions (LxWxH) 6.7 x 5.35 x 3.5"